In early February, more than 12,000 writers, editors, teachers, and publishers descended upon Washington, DC for the annual the 50th Annual AWP Conference and Bookfair. 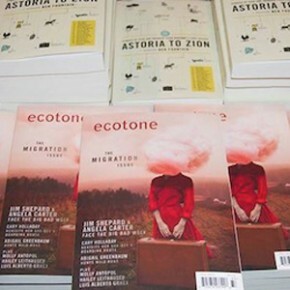 Taking a break from the action (read: filling tote bag after tote bag with new books), four UNCW MFA candidates stopped by the Lookout + Ecotone booth to share with us those titles that carried them into the new year. Station Eleven was suggested to me by a trusted reader friend after hearing my complaints about literary depictions of post-apocalyptic worlds that leave civilization in a survivalist state. The narrative follows Kirsten, a traveling performer, twenty years after a viral outbreak killed most of the human population. She tours with a band of actors and musicians who perform in the villages and settlements they rest at within the Midwestern United States. The troupe’s go-to performances are Shakespeare plays. I had my copy of the book signed by Emily St. John Mandel at last year’s AWP, even though I hadn’t finished it at the time. What I admire most about Station Eleven’s narrative is its devotion to the survival of the arts instead of just that of humans. It defines being human as preserving these arts, which make up our culture. Without drama, music, writing and art, what would our existence be? George Harrison said, “Music should be used for the perception of God, not jitterbugging.” In Robert Ostrom’s latest collection of poems, Ritual and Bit, we see an artist not only challenging us to perceive a God but also talking directly to a God in prayers, an artist inserting himself into the story of creation. What is it to be homesick with spiritual memory, being fully aware that we’re reconstructing our memories every time we retell them? Ostrom leads us through with intimacy: “Trust me, says what you’re about to read to your beautiful ear.” He takes us to a place where words are relics—each one holding a little life, beauty, loss. And we leave haunted, but in a good way. We’ve felt an exquisite purpose. Over the summer I began reading What About This? Collected Poems of Frank Stanford. Stanford was a Southern writer who, because of his early death by suicide in 1978, was not widely read during his lifetime. This collection was published by Copper Canyon Press in 2015 and includes previously published and unpublished fragments of poems. His poems are relatively short, usually less than thirty lines, but because of their cryptic language they speak above and beyond any single moment. Stanford has the ability to talk about these strange characters from the South and Midwest without being anchored in an exact time or place. I read his work and know that whatever sense of understanding I glean could still be so far from the vast map of meaning he had in his head at the time of writing, and that is the exciting part. I am left with raw emotional data every time I read his work. His poems are like circus freak shows moving through the night on an open train; there is a history in each word but the reader only can glimpse it for a passing second. I’d been meaning to read Eula Biss’s first book, The Balloonists, since reading her essay collection last year. The Balloonists works as a series of prose poems, one long poem, or a lyric essay; her Anne Carson-like genre defiance is one of the reasons I keep returning to her. She studied nonfiction under three poets and after reading this book—about married couples as people “not especially interested in intimacy, who somehow ended up married,” and about Biss’s mother, who tells her that she is “not a liar, but that she is not what [Biss] writes about her”—I think poetry may be the most insistent way to learn how to write in prose.